On December 6th Kathleen and I were blessed with a beautiful baby girl. Nyla was born 6 pounds 7 ounces, 19.5 inches long. Raja will be working reduced hours the final 2 weeks of December in "Paternaty Leave." Kathleen's sister Sarah will be helping us out while Kathleen is on Maternaty leave. Saah will be making calls to collect subscription fees. Please welcome Aunti Sarah to the Marijuana Software team! Now you can buy hardware like Zebra Label Printers, Star Receipt Printers plus labels, receipt paper and more directly from our new OMMPOS Store. Check out our new and improved store here! Switching From Medical Marijuana Dispensary to OLCC Retail? The Department of Revenue wants to help the marijuana industry understand the changes in the tax collection process if they convert from operating as an Oregon Health Authority medical marijuana dispensary to a marijuana retailer in the Oregon Liquor Control Commission (OLCC) regulatory environment. Once an OLCC license becomes effective, the taxes you collect on your customers’ purchases of marijuana and marijuana products will change. The "Early Start" rate now in place for medical marijuana dispensaries is 25 percent, but the retailer rate is 17 percent. You should charge your customers the lower 17 percent rate when your OLCC license takes effect. Whether you remain a Medical Marijuana Dispensary or become a Marijuana Retailer you’re still responsible for filing tax returns with the Department of Revenue. What and how you must file depends on when you transition. If your OLCC retailer license takes effect on October 1, 2016, you should electronically file your first retail tax return for the 4th quarter of 2016 on Revenue Online. You should also file your final return as a dispensary for the 3rd quarter of 2016 using Form OR-581. If you’re transitioning at the end of 2016 and your final day of sales as a medical marijuana dispensary is December 31, 2016, and your OLCC retail license takes effect on January 1, 2017, you should electronically file your first retail tax return for first quarter 2017 using Revenue Online, and for the dispensary’s operation for the 4th quarter of 2016 file a Form OR-581. For any other transition scenario, you’ll be required to file two returns for the 4th quarter: one on paper for the 25-percent tax rate and one electronically on Revenue Online for the 17 percent rate. You will want to keep detailed sales records to track when your tax rate changed, so that you can accurately file reports for the two tax rates. Please contact the Department of Revenue at marijuanatax.DOR@oregon.gov with any questions. Do not operate a vehicle or machinery under the influence of marijuana. Keep marijuana out of the reach of children. Contains statements that are deceptive, false, or misleading. This includes but is not limited to using cartoon characters, toys, or similar images and items typically marketed towards minors in the advertisement. Specifically encourages the transportation of marijuana items across state lines. Assert that marijuana items are safe or safer for reasons including but not limited to because they are regulated by the Authority or have been tested by a certified laboratory. This includes explicit or suggested claims related to a disease or condition. Examples are “relieves symptoms of depression” or “cures cancer”. Unsubstantiated health claims cannot be used as part of a company’s business name. Show consumption of marijuana items. A registrant may not make any deceptive, false, or misleading assertions or statements on any product, any sign, or any document provided to a patient, caregiver, or to an individual. If a registrant is found to be in violation of any of the advertising rules, OMMP will notify the registrant and specify a reasonable time period for the registrant to remove any sign, display or advertisement. If the sign, display or advertisement is not removed or an advertising issue continues, the registrant will be issued civil penalties of up to $500 a day or may have their registration suspended. Marijuana tax drops to 17% on October 1st! Starting October 1, 2016, all cannabinoid products, concentrates and extracts must be compliant with labeling rules found in OAR 333-007-0010 to 333-007-0100, see also 333-0081200(8) and 333-008-1740(10). For Dispensaries: Any marijuana items in a dispensary that do not meet the new division 7 labeling requirements on October 1st must be returned to whoever transferred them or the dispensary must dispose of the products. The dispensary must document any returns or disposal of products. Starting October 1, 2016, all marijuana items, except immature plants and seeds, must be packaged per OLCC packaging rules found in OAR 845-025-7000 to 845-025-7060. Also see OAR 333-008-1200(8) and 333-008-1740(10). A dispensary or processor who packages marijuana items for ultimate sale to a consumer, patient, or caregiver must transfer all marijuana items in OLCC approved child-resistant packaging starting October 1, 2016. This includes flower and all other marijuana products but excludes immature plants and seeds. A dispensary may use child-resistant exit packaging to comply with the rules. It is a business decision between the processor and the dispensary regarding who should provide the child-resistant packaging. Starting January 1, 2017, an OHA registered medical marijuana dispensary can only sell marijuana items to OMMP patients and caregivers. Sales made to anyone other than registered patients and caregivers will result in enforcement action against the dispensary. Any registered dispensary, processor, grower, patient or caregiver that is found to be violating any of the rules may be subject to civil penalties and/or have their registration suspended or revoked. OAR 333-008-2180 through 333-008-2200. 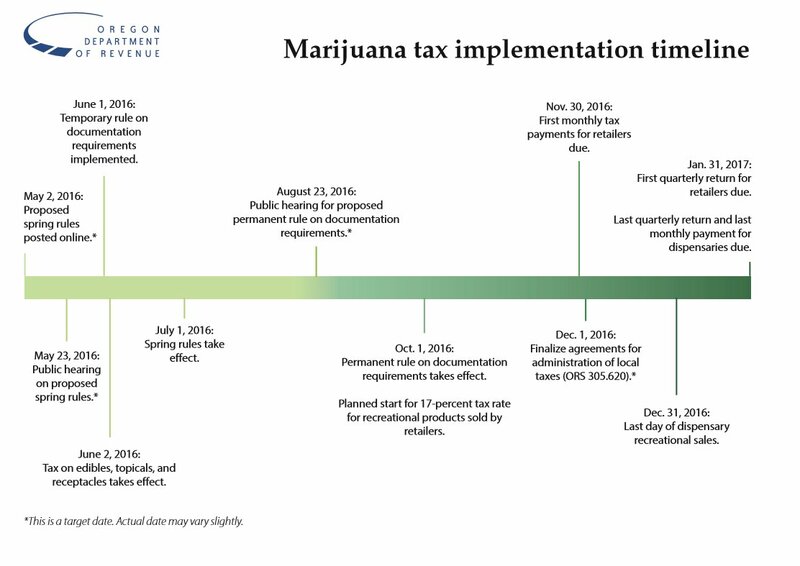 The Oregon Medical Marijuana Program (OMMP) is approaching a compliance deadline of October 1, 2016, for transferring, labeling, setting concentration limits, packaging and testing of marijuana and marijuana products. For Dispensaries: On or after October 1, 2016, a dispensary may continue to sell marijuana items that were not sampled and tested by an accredited and licensed laboratory if: The items are transferred to the dispensary before October 1, 2016; The items comply with the concentration limits, labeling and packaging rules found in division 7 of the rules; and The items are labeled with a label that reads “DOES NOT MEET NEW TESTING REQUIREMENTS” in 12-point font, and in bold, capital letters. A dispensary will only be allowed to transfer these products to patients, caregivers and consumers until January 1, 2017. Beginning October 1, 2016, all cannabinoid products, cannabinoid concentrates or extracts must meet the concentration limits as outlined in OAR 333-007-0200 and 333-007-0220. Lowdose cannabinoid edibles sold to retail customers from medical dispensaries during the early start period must continue to meet the definition found in OAR 333-008-1500(1)(k). All products sold from your dispensary have to have labels compliant with OAR 333-007-0010 to 333-007-0110. The OLCC requires non-generic labels (labels containing your company logo) to be pre-approved before you can use them on your products. OMMPOS produces generic labels that do not require OLCC pre-approval and are automatically complaiant. Use OMMPOS to produce compliant labels with both OHA and OLCC regulations automatically. The Oregon Health Authority, Public Health Division is temporarily amending administrative rules in chapter 333, division 7 related to marijuana labeling, serving size and concentration limits. The temporary amendments are to extend the effective date of the labeling and product serving size and concentration limits requirements from April 1, 2016, to June 1, 2016, due to the time needed for dispensaries and producers to adhere to rule changes.